a little temporary improvisational architecture. a very imperfect, too soft picture. softness is what i feel towards her. a visit to darlene's this morning affirmed what i've been thinking lately, especially last night when it all made sense and i thought i could put it into words. that we all have cameras that give us beautiful perfect images and we have lenses that give us macro shots that make us all ooohhh & ahhhhh and we have photoshop or other programs that give us ways to beef up color and make the pretty prettier, and now that we all have that and can do that, now what? do we stay there in that place, that age old question of is it a cool picture or just a picture of something cool?, or do we move forward? i've watched my images purposely become more & more imperfect with better lenses, bored with just pictures, wanting my images to be more, wanting them to impart a mood, a feeling, a sense. i don't want bad stuff, and there's a difference (although no doubt someone out there will disagree), but once you know how to take a good picture, do you stay there, or do you move on? and it's important to know how to take that good picture before you begin to break the rules, just as picasso could paint realistically before he moved on (and no, i am not in any way comparing myself to picasso, although one can dream - lol), just as a writer can only successfully break the rules if she knows them in the first place. craft should never be misunderestimated. 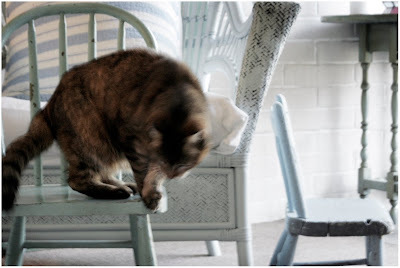 in the image above, i knew i had it when maggie moved, when the curve of her back suddenly echoed the curve of the chair back - i'd already composed the image and was already shooting, waiting for that moment, and i knew it when it came. it was the last shot i took. i see the influence of blog images in advertising lately - out of focus shots, that feeling of imperfection. you may argue with me that that's not true, that it's coincidence, but i would say you are wrong. fashion and art always start down here in the ditches, on the street, and work their way up, and i find it exciting to see the changes on the pages of magazines and know that i know people who influenced that, and i truly believe i do. i know i do. i continue to search for the perfect imperfect, to work easily to have the image say what i want it to say, and i am happy with the direction i am headed. small steps, baby steps; the yes i feel when i view a shot that's what i saw in my head, what i felt, keeps me moving forward with perhaps bigger strides. i see so many others doing the same, so many ahead of me, so many different, but everyone finding their place, their voice, their vision. i know so often whose image it is when i first see it, a true sign of settling into who you are, who we are. a sign of settling into our truths. which is a subject for another day. a day when i work up the courage. Yes, you and your images are definitely headed in the right direction, the perfect direction...and I agree with what you say, I work as a graphic artist so I notice these things, and I've noticed, recently, how the digital collage images are making their way into ads and editorials and I thought the same thing, it came from the blogs...and you are right, craft should never be misunderestimated, and neither should women...or truth. A friend and I were just this morning talking about how the days of film were in some ways simpler... You got your shots and sent them off. What you got, you got, and learned from there. I think the endless pursuit of "perfection" is doing society not one bit of good, and you are definately on to something. I agree with what you wrote. For me, at the newbie edge of photography, I appreciate the ability to work on my images because that way I can get them closer to what I actually saw in real life and what my scrappy little camera could not quite translate. But my favourite photos are the ones which capture feeling rather than image. this is soooooo amazingly true and honest and i feel the same way ! i'm still a 101 student of photography, but i get what you are saying. for those of you who have mastered the techniques, understood the "rules," done your time creating the "perfect" photo, you now have the mastery to create art. it's like cooking... you have to understand what makes a recipe work before you can successfully morph it into your own. (and, like writing, where you should never use an ellipsis for a pause... lol) i look forward to your post on truth. Your words echo so true to me. It is within the imperfection that the 'art' and 'emotion' occur. Hadn't particularly thought about how blogging might be influencing the advertising world..but that there might be some truth therein. Great post. And probably quite true. I don't really care about trends but I can see them, too, on the blogs and elsewhere. I love digital photography because of its instant gratification and post processing because of its creative possibilities. I go with what feels right to me and there is a lot of trial & error in the process. I never had the patience for film photography and it seems I prefer to fix and manipulate afterwards, rather than plan it ahead. But I agree, it is good to know the craft, too, and after never quite understanding it with film cameras I finally comprehend aperture and shutterspeed :) Like with any piece of art I look at, I never care about the status of the artist, or even where and why he did what he did. Or she. All that matters to me is how the art speaks to me on an emotional level, does it evoke feelings, does it give me a sense of recognition? That's my only subjective criteria when it comes to art and photography. K.
I am fascinated by what you've written here. I was just talking to my mom and telling her that I wasn't sure I would ever have a "look." I sure don't yet. I love how so many of us spend time thinking along the same lines. We have created quite a tribe for ourselves, haven't we?